A Spanish manufacturer of HPDE cubitainers and containers based in Cataluña has chosen SatrindTech to implement its recycling line of defective cubitainers. The request received by our Sales Department was to replace an existing SatrindTech twin-shaft shredder, in use since the mid-1990s, to now be able to ensure a regular size of the shredded material. 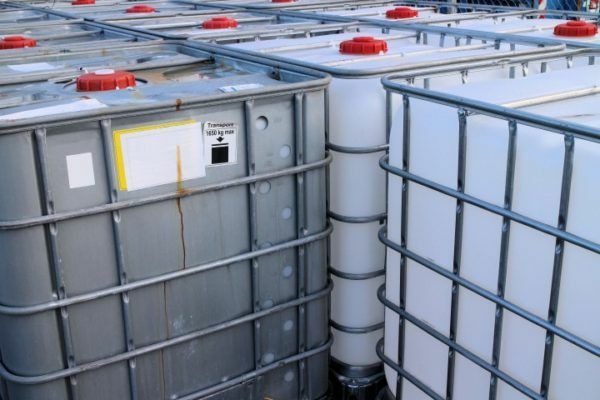 The cubitainers are HDPE containers of approximately 1 cubic meter of volume that, inserted in a metal cage, are used in a wide variety of industrial sectors (oil+gas, food, medical and chemical sector, just to name a few) stocking and handling liquids or juicy materials. a 1000 mm shredding chamber and completed with our patented CL system. This counterblade system, patented by SatrindTech, enables conversion of a dual-shaft shredder model, with which it is normally only possible to perform volumetric, and therefore irregular, reduction of the processed material in a machine capable of shredding materials with a pre-defined size. A fixed counterblade located under the blades, together with grilles under the shredding chamber of the machine, allow a continuous process of material shredding so that it can be expelled from below upon reaching the required size. Cubitainers are a type of material for which it is advisable to use a special hopper, called angular, so that material, with its typical cubic shape, can slide inside the machine at an angle of 45° from the centre distance of the blades, thus facilitating gripping by the blades. The configuration selected by our customer will allow them to process one cubitainer per minute, obtaining a final size of the product being processed of approximately 50 x 50 mm. Further information on the CL system is available by downloading the relevant technical data sheet here. Use this link to watch the example video. For any other request for free quotes of our industrial shredding solutions, please contact our Sales Department by writing to sales@satrindtech.com or by calling the number +39 (02) 9037 6683.